Smaller than compact sized refrigerator. It can be set up anywhere and almost don't need to install other equipment. Also it can be operated by water, wastewater system and electricity (except some types) for ordinary household. Safety is enhanced by carrying out a test for water pressure, doubling of safety mechanism, safe design container, etc. over and over again. And no need to have a special license or qualification for high pressure processing. It is easy to operate because of system developed for MAGIC EXTRACT. Adopting touch panel display makes you to operate easier. The pressure built up in this device is maintained mechanically. Electricity that you need while it's doing this is only for display panel and heat-retention. Minimize electrical power consumption. This device is sparked by Niigata prefecture community gathering research and development program "Basic technology development in high value-added food" and developed. It is confirmed that high pressure processing (under 100MPa) that our product provide breaks up protein into amino acid and make food better tasting. It is effective on some level for gram negative bacteria, such as Coli, salmonella, pseudomonas, and legionella and so on. In agricultural industry, it is also effective to promote the growth speed of seeds. 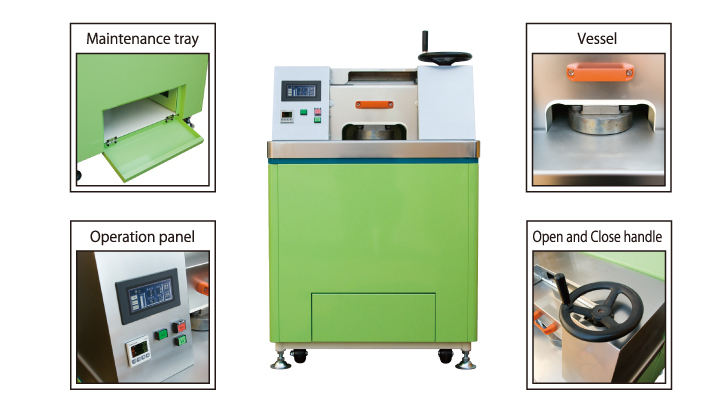 This device has a great potential to carve out the future in not only food processing, also chemical industry, medicine, biotechnology industry.